Copyright � 2009, The University of Tasmania. Most current approaches to conversation system development invoke a complex set of language parsing rules or development tools difficult for the uninitiated to handle and unable to achieve the appearance of actual involvement in the conversation at hand or topic awareness. This study proposes an alternate approach based on the Ripple Down Rules algorithm, presently used to enable more effective maintenance of expert systems. 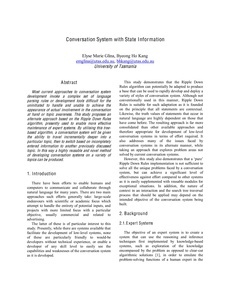 By utilising this tree- based algorithm, a conversation system will be given the ability to travel incrementally deeper into a particular topic, then to switch based on incompletely entered information to another previously discussed topic. In this way a highly reusable and novel method of developing conversation systems on a variety of topics can be produced.